Well after getting into the swing of things and designing six units I’ve learned a few things about the process and got a much better handle on how to adjust the MTS to get the results I want. So due to a better understanding of the system and the comparative expense of the Saxon Armour’s I’m going to make a few tweaks to the Sweord and Pendragon Knight Armour designs as well as introducing the Claymore and Dirk Knight Armours. Remove the Pod, turns out you dont need to account for storage for handheld weapons which is what all the Sweords weapons are. Speaking of the lance, I added it originally to go with the motif of the Knight Armour being equivalent to the nights horse. But when you think about knights and their lances you dont picture them running with it, you picture them charging in and crashing into stuff with it. So to that end I’m going to add a Boosterpack to the KA’s. It works basically like a Nitro but for mecha, it allows the pilot to temporarily boost the units movement. You can have it mounted either externally (in which case it runs into B-MOD issues like Command Armour) or Internally (which means it increases weight and takes up space). I’m going to go with the latter. This is also meant to work as an option to prevent ranged weapon using opponents, like the Saxons, from “Kiting” the KA’s. So I’m going to use a booster that provides a Boost Pool of 20 MA points (the pilot can add these to his base MA in any amount he wants, but once expended theyre gone until a suitable amount of time has passes), that costs 2 CP, he can also use up to +10 at once (x1.6). So thats a total cost of 3.2, with one level of space efficiency, which brings it to 3.7. Remove the Maneuver Vernier Bonus, because with the stats calculated properly the Sweords MV is -2 without it. Well at this point I’ve actually managed to reduce the price of the Sweord down to 264.6 CP. Balls. All that weaponry has pushed its weight up too high so another level of Weight Efficiency is needed. This pushes the total cost to 288.2 CP, which is better. But theres still room for some improvement. I’m going to change the armour type on the torso to Beta. I’m also going to give it Underwater Environmental Protection. Because I want the KA’s to be able to swim without worrying about it. That brings us up to 299.47 CP. To be honest I’d like it higher but cant think of anything to add that doesnt feel forced. I should probably also tweak the Pendragon a bit. Add on the same Boosterpack and Underwater Envrionmental Protection as I added to the Sweord. Add a level of Maneuver Verniers so its as agile as the Saxon Armours. Along with some Space Efficiency as Maneuver Verniers are rather large. That pushes us up to 480.59. 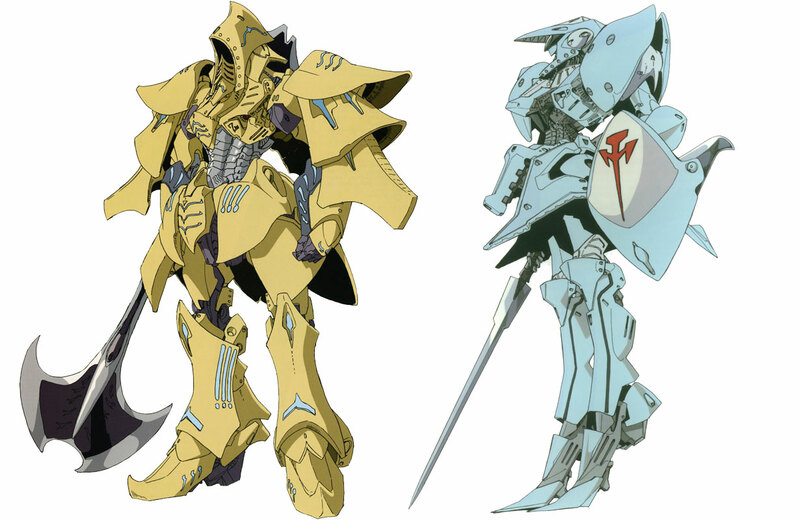 Which is almost twice the Oegn and a good bit more than the Sweord. So the Pendragon retains its place at the pinnacle (well the Saxon Ettin SA cost’s more, but thats ok as it’s meant to be a monster). So with those tweaks in place (and they may not end up being the last tweaks) its time to bulk out the ranks of the Knight Armours with “Heavy” (Claymore) and “Light” (Dirk) units to match the Sweord’s “Medium” unit. Ideally I want the choice to go with a Light/Medium/Heavy KA to be a stylistic one. In essence they should all cost the same amount of CP in order to have some kind of “balance” between them. I’ve a feeling that means I’ll be back to tweaking the Sweord at the end of all this. Not really a lot of high concept stuff going on here. 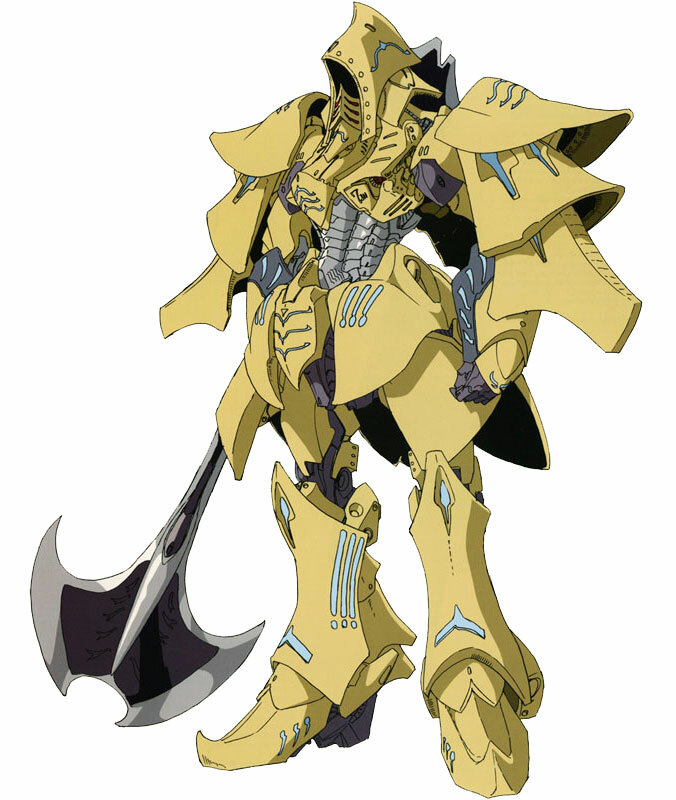 It’s a more heavily armoured Knight Armour that trades off mobility for being able to take a kicking. Going to go two steps up from the Sweord and use all Medium Heavy Servos. Humanoid body form, no wheels or treads. 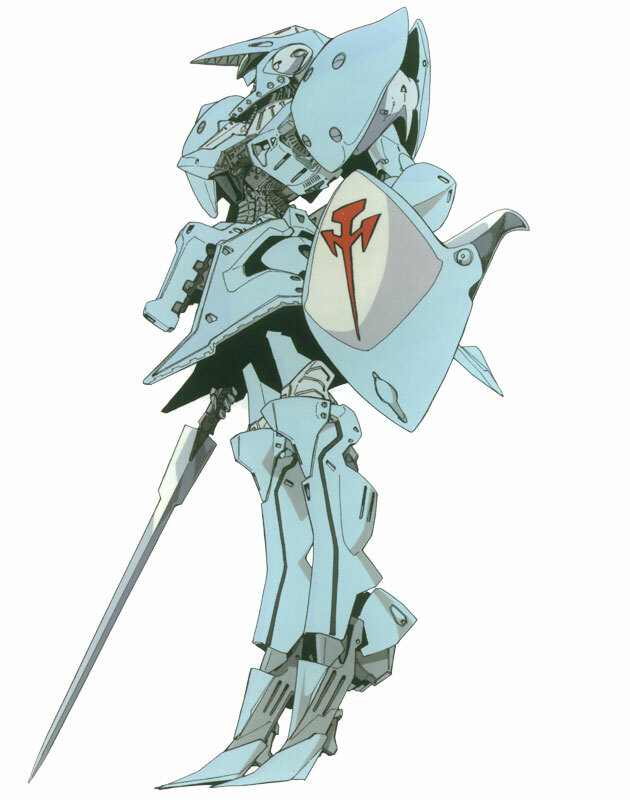 I’m also going to use Medium Heavy Class (8 SP) Alpha type (x1.25) armour on all servos. The shields already been accounted for. Theres space for 1 pilot and 1 passenger and it uses the basic Medium Heavy sensor suite. The only other additive systems are the liftwire and escape pod. Well the multiplied cost is 334 CP. 35 CP more than the Sweord. Which is a tad too much I think (or maybe it isnt, I dont have a solid handle on how big a margin X amount of CP points means n terms of overall performance). I can save a bit by reducing its sensor suite to Mediumweight class (actually I think I may do this with all the units as I’d prefer to have all “types” have the same basic sensor abilities). I can also remove the passenger space. That saves us ~14 CP. In the end I think 320 CP is fine. The Claymore ends up with a MV of -4 and a land MA of 3. So its slow and a little clumsy (+0 is the soft cap for MV). But it is a fair bit tougher than the Sweord. I cant afford and dont want Command Armour on it. Theres no need for scaling and it has no remotes (The next unit I build is going to have remotes just so I cant stop breezing past it). I also took care of the finishing touches in the overview section. I can think of a few ways to upgrade this unit. But that can weight for the “Second Season” of the campaign. More or less the reverse of the Claymore, the Dirk trades resilience for speed. The Dirk should be on par or slightly superior to the Saxon Armours in terms of basic mobility. It will however also be as “fragile” as ordinary SA’s. Humanoid body form. The servos are sort of all over the place. The core torso servo is actually the same class (Mediumweight) as the Sweord. Thats largely because the PC is likely to be there and I want to add a bit of survivability. The Leg servos are one step down (Heavy Striker) but the arms and head servos are two classes down (Medium Striker). The Dirk is also going to make use of the wheels and treads option. Both at once in fact, wheels provide an MA bonus and Treads allow you to navigate difficult terrain. So the Dirk is going to have both, it’ll go fast everywhere. So Heavy Striker class wheels are 5 CP and treads are 10 CP. For a total of 15 CP. The armour will be Heavy Striker Class (5 CP) Alpha type (x1.25) all over. Again the Dirk shares a similar loadout to the other KA’s, Light Lance, Surge Shield, Bow and melee weapon. In this case the Dirk’s melee weapon of choice is the “Estoc” which is a smaller but speedier version of the standard KA blades. So thats 4 Kills (2 CP) at +0 Accuracy (x1.0) with the Quick (x2.0) attribute. The Dirk uses the standard KA Surge Shield. It has room for one additional passenger and uses the Mediumweight class sensor suite. The only additive systems are the liftwire and escape pod. The Dirk’s base weight is fairly high at 58. Thats almost certainly going to require some weight efficiency. But I want to leave that to a later stage until I get a better idea of the units cost and stats. In terms of propulsion systems the Dirk has the standard “Lancer” boosterpack system as the other KA’s. Which gives us a base price of 155.4. Nice and low for the moment. For the moment the only multiplier systems are going to be Thought Control (x0.5) and Regeneration (x0.25). I may want to add Maneuver verniers but that can wait for later. This gives a multiplied cost of 271.95 CP. It also leaves us with a MV of -2 and a MA of 6. No CA, scaling or remotes. At the moment we’ve a few CP to play with and I want to get that MV up. I could add Manevuer Verniers but I also wouldnt mind seeing the MA increase either so I’m going to try Weight Efficiency. A Weight Efficiency of 19 (38 CP) pushes our cost up to 309 CP (which is close enough to the Sweord for my liking) and brings the MV to 0 and the MA to 7. Which is the kind of speed and maneuverability I want out of the Dirk. Now unfortunately I sort of forgot about Underwater Envrionmental Protection (I didnt add it to the Claymore because I couldnt afford it).Adding it will cost 8 CP. Which is a bit too much at this point. So I’m actually going to remove the treads. This will leave the Dirk with the +2 MA from wheels but means it could have problems with difficult terrain. Which of course makes adding them back in a good way to start upgrading. Removing the treads reduces the weight which in turn means we dont need as much Weight Efficiency. So after removing the treads and adding underwater EP our final weight is 39 and our final cost is 289.72.